One third of UK businesses say they don’t understand what ‘alternative finance’ is and a further 29% are completely unaware of alternative funding options according to research published by Aviva in 2014. But that’s about to change. The Small Business Enterprise and Employment Bill is due to become law in early 2015 and will require banks to help match small firms with alternative lenders if they haven’t been able to give them a loan. Small business owners can also use the Alternative Business Funding website to find the right provider. This website brings together market leaders in all the main forms of alternative business funding – including crowdfunding, invoice trading and peer-to-peer lending. If you’ve got an idea for a business, especially in the digital and creative sphere, crowdfunding can be a great way to get it off the ground. Sites like Kickstarter and Indiegogo allow you to pitch your idea to a wide audience of potential investors and you can reward them with perks such as a discount or a free gift. However, not every pitch is successful and about half fail to meet their targets so it’s worth reading these ‘Five top tips for crowdfunding your business by Crowdfunder UK‘. Those that succeed typically pay the platform a fee of about 3-7% of the amount raised although it depends on how you run the campaign. Other forms of crowdfunding now include equity-based models such as Crowdcube and Seedrs. Whichever platform you choose, you’ll need a business plan and financial forecasts. Above all, you need to tell your story in a way that inspires others to support you. Peer-to-peer lending offers established businesses (trading for at least two years) a way to get a cash injection by attracting a group of investors and paying them interest on the money borrowed. With Funding Circle for example, you can apply for up to £1 million of funding. Investors include councils, the UK government and financial organisations as well as individuals. Another peer-to-peer platform is ThinCats, an ‘online market for secured business loans’ where businesses can borrow up to £3 million and investors earn 9% interest on average. Like crowdfunding, you’ll have to provide a business plan and detailed financial information. You may also have to provide an asset as security. Start Up Loans were introduced by the UK Government to give start-ups and new businesses access to funding and advice through a network of delivery partners across the country. At the time of writing, over 30,000 loans have been made in the UK with the Government setting a target of 75,000. Community Development Finance Institutions (CDFIs) are social enterprises that lend money to local businesses and people who struggle to get finance from high street banks. There are around 60 CDFIs across the UK and they provide support and advice as well as finance. You can locate your local CDFI on the Finding Finance website. An angel investor usually brings both money and experience to the table. Whether they are individuals or part of a network, angels are looking to invest in early-stage businesses and are looking for equity shares in exchange for their financial backing. The right angel can bring much needed expertise and experience to an ambitious start-up. The Angel Investment Network brings together more than 400,000 entrepreneurs with over 40,000 investors. There are thousands of grants available to businesses but getting access to them is not always easy. A good place to start is the ‘Finance and support for your business’ tool on the GOV.UK website where you can search for grants by postcode. In addition, several independent websites offer the chance to search for grants. The GrantFinder website, for instance, has details of more than 8,000 funding schemes including grants, loans and awards from local, regional and national UK government, European funding, charitable trusts and corporate sponsors. Another useful portal is j4bGrants which has a searchable database of grants. Many grants are offered at a geographical level. European grants are available through European regional development funding. Within the UK, grants are available through the Regional Growth Fund and also via Local Enterprise Partnerships. Many industry bodies also offer grants, such as the Manufacturing Advisory Service. There are also grants for unemployed people that want to set up their own venture. Similar to Jobseekers Allowance, the New Enterprise Allowance scheme is aimed at people who are unemployed and would like to start their own business. Tax relief schemes can help businesses to get funding. The Enterprise Investment Scheme (EIS) and the Seed Enterprise Investment Scheme (SEIS) are government schemes designed to help smaller higher-risk companies to raise finance by offering tax reliefs to investors. Other government help includes Innovation Vouchers (offering £5,000 for SMEs to use to pay for expert advice). An invoice financier will buy your unpaid invoices for a fee, so you can improve your cashflow while you wait for payment. Invoice financing is available through financial providers including banks, and there are also online services such as MarketInvoice. There are two types of invoice financing – factoring and invoice discounting. Factoring involves the invoice financier collecting money owed to you. They typically buy the debt for about 85% of its value and pay you the remainder when the customer settles their bill. You then pay any interest and an agreed fee. With invoice discounting, the invoice financier lends you money against your unpaid invoices. You are responsible for collecting your debts and when the customer pays the money is paid to the invoice financier along with the fee. Asset finance (such as leasing and hire purchase) can help when you need to invest in new equipment. With leasing, you are paying for use of the asset but you do not own it at any point but with hire purchase, you own the item at the end of the agreement. Asset finance offers some advantages – you may be able to afford to buy better equipment, interest rates are usually fixed and the main risk is losing the asset. However, there are downsides. In most cases, you can’t claim capital allowances on a leased asset if the lease period is less than five years. And, of course, the equipment will be more expensive in the long run. Another asset-based funding option is asset lending. Companies like Borro, for example, provide short-term loans secured against high net-worth assets – anything from cars to art. 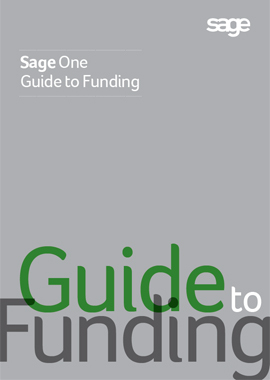 For more helpful tips and advice on how to secure funding for your business (and manage it when you get it), download our free ‘Sage One Guide to Funding‘.